Note: Episode 31 had sound issues but I will try to salvage as much as I can and post it. NOTE: All future secthis gear reviews will be located at gear.secthis.com - this is a sample. As hosts of secthis.com podcast we are always buying new gear - be it tech or firearms - and often we talk about it on the podcast. Well now we are going to add a new section to the website where we post short reviews of this gear - in secthis.com style of first having a drink, then writing a review! If you think this is a good idea, let us know by emailing Gene. If this is a bad idea then email Mooner! No seriously send any of us mail and let us know what you think. We have a number of items that we are ready to review for you, so let me start with the first utterly useful item! Watches with dual time zones are generally referred to as GMT models. So while I really like the look of the Rolex GMT Master II, it would not have passed the 'wife' test, nor does it have tritium or back lighting. I did find a KHS Operator Timer, great looking Tritium watch, but it was neither an Automatic nor a GMT. After doing more research I did find an automatic Tritium watch, but again it was not a GMT. This was the Tracer Classic Auto Pro. 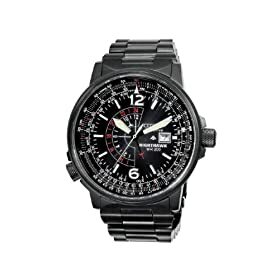 If I did not need the GMT capability I would certainly have purchased this watch. It really looks nice and uses the same Swiss Auto mechanism as the Omega watches. So was there a watch that was Automatic, GMT, and Tritium? Well as it turns out there is one - the Ball Engineer Hydrocrbon GMT - and my finger was on the purchase button when my wife stopped by and convinced me not to buy it. She made me a deal that if I she'd buy it for me as soon as she passed her CISSP. So I was back to looking for an Automatic, GMT, with Tritium. I expanded my search to include solar watches not just mechanical automatics. I still wanted dual time zones, and either tritium, or some other backlight. I found a few models that seemed to fit the bill until I stumbled on the Citizen Nighthawk. This was a nice solar watch that combined solar power, second time zone and a decent backlight. Again I was ready to buy, but while doing a price search, I found the Citizen Skyhawk Atomic Eco-Drive - another model that had the same features, but also had a 3 timezone display, and received the radio signal broadcast from the atomic cesium clock in CO. On top of that it had a very nice rotating slide rule. This seemed like it would fit the bill! So now I have a watch which keeps time as precisely as a GPS, is self-powered even if I am not wearing it, and has amber LED back lighting which won't kill my night vision. If you look at the closeup video you can see that it has a constant UTC (GMT) face, a 24 hour local time zone face, a main 12 hour local time face, and another time zone display is possible in the digital display. It may not win any style awards at the office, but in the field this is a ruged, completely automatic (it will even switch to daylight savings automatically), and functional watch for anyone who needs more than a basic dress watch. Retail under $600 is well under many of the Swiss watches I looked at. And here is the short closeup video.